If you’re trying to lighten a traditional pasta dish like Shrimp Scampi, try substituting “zoodles” for noodles! Zucchini can be cut into long strings, mimicking the look and feel of noodles. The best news is, these “zoodles” taste great! Perfect for cutting back on carbs, this tool will be one of your new best friends! 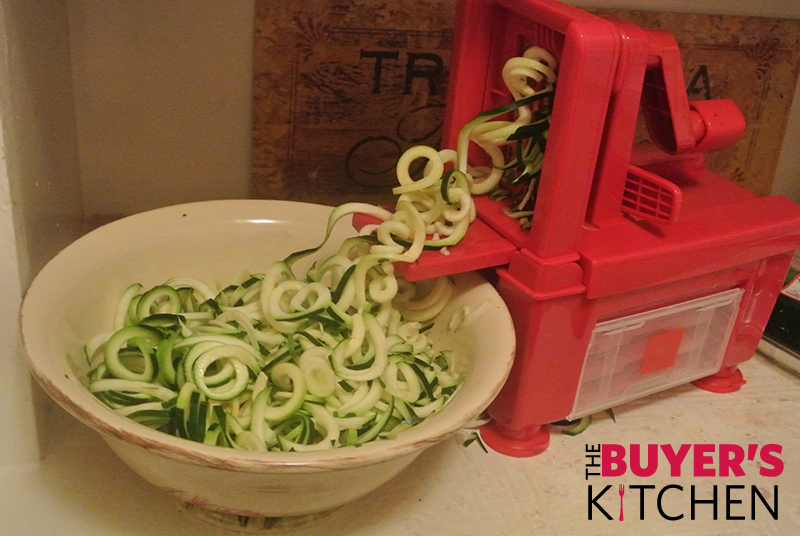 Available in all price ranges online, a spiralizer is a great addition to any kitchen! 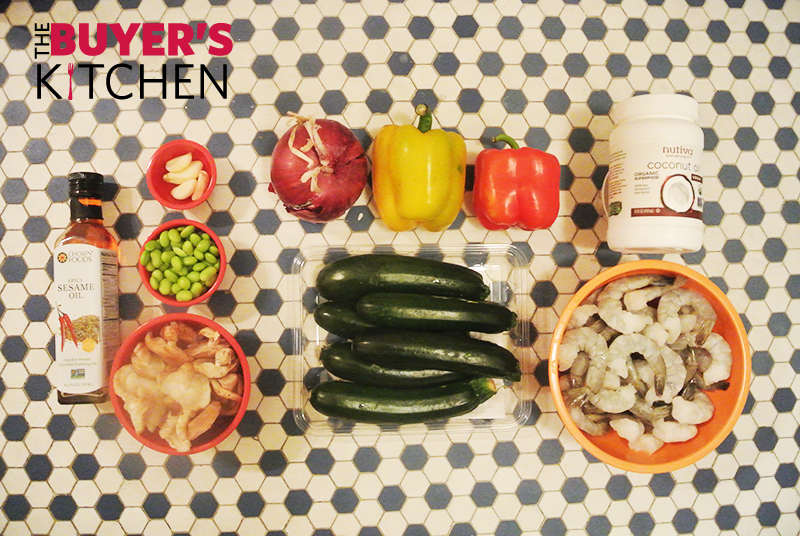 Rinse shrimp in a colander over cold running water until thawed and set aside. 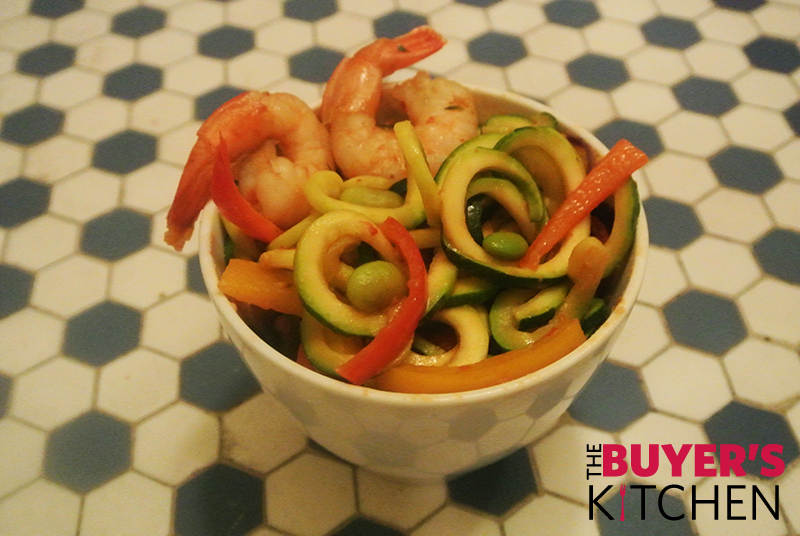 Set up the spiralizer onto a flat sturdy surface and place a medium sized bowl below the edge. Choose a medium- wine spiral width. Cut the stop and bottom off of each zucchini squash and spiral cut each squash and set aside. In a large wok, head the coconut oil and sauté begin to the onions for about 1 minute. Next add the bell pepper and sauté for about 3 minutes until tender. Add the garlic, mushrooms, soy beans, sesame oil, soy sauce and Sriracha into the wok and mix to incorporate. Place the shrimp into the wok and sauté until cooked through and pink, about 3-5 minutes. (Be sure to not overcook the shrimp or they will become tough). Once cooked, remove the shrimp and place into a medium sized bowl, cover with foil and set aside. Add the “zoodles” into the wok and sauté for about 2 minutes until the zucchini is heated through but not soggy. Add the shrimp back into the wok, serve and enjoy!